A post on the Facebook Mobile Page, which some received as a mobile ad, reminded those who have installed the Facebook Home launcher, or who are considering it, that it can be deactivated allowing users to return to their widgets. Deactivating the launcher also gives the user some quiet down time without having his or her phone constantly interrupted by Cover Feed. Those who have the HTC First, which is sold with Facebook Home pre-installed, also have the option of shutting it down and using the device like any other Android model. Even though Facebook COO Sheryl Sandberg said at D11 this past week that those using Facebook Home are using the social networking site 25% more and are sending 10% more messages, the app has been a ratings flop at the Google Play Store where it is limited to newer top-shelf models. AT&T is rumored to be dropping the HTC First after dropping the price to a mere 99 cents on contract. Earlier this month, we told you that many are blaming the poor planning behind the launcher, to the fact that most Facebook developers are Apple iPhone users and wouldn't recognize the importance of a widget if it jumped up and bit them on the derriere. There is talk that a new version of Facebook Home is in the works which will address the issues from Android users that has prevented the app from becoming well-received. "Facebook Home is v1 of what we think is a very large transformation that we think will absolutely happen, which is rebuilding your phone around people. The way [phones are] organized is still around activities and apps. 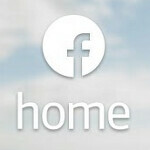 We think that phones will be reorganized around people, and we think Facebook Home is the first version of that. We consider it v1, very early. We’d love if we could put out a v1 version and get everything right. The feedback we’re getting is very bi-modal. If you look at our stars, we get fives and we get ones. We get almost no threes. The people who love it, they’re heavy Facebook users. They want that experience. Not only do they love it but the metrics are working very well for us. They’re using Facebook 25% more and they’re doing 10% more more messaging. So this is a win, both in terms of how this will drive our business and for them. Maybe they should be reminded that Facebook Home is redundant if it's to be turned off 'permanently'. That is so not true. It can deactivated on the First also. Deactivating is not the same as uninstalling. I hear ya, but once you deactivate it, you don't have to see it ever & you essentially have a stock Android device. It's never a good sign when an ad is telling you that you don't have to use the service. I do hope this is the first step in OEM custom UI's being able to be uninstalled. I have used a custom launcher since 2010......so I rarely see the orig home screen setup. I can deal with the UI throughout the rest of the phone...but the launcher just never seems to be what I like. Sense UI is the exception....I hate Sense UI everywhere. I do like Blur or whatever Motorola is calling it these days.....but I still dont use the launcher. Never used Touchwiz....cant really comment on it...but I just like what it looks like vs Sense UI. Infact I've deactivatet the hole facebook for a long time , Now I enjoy my real life !